Fig. 1. 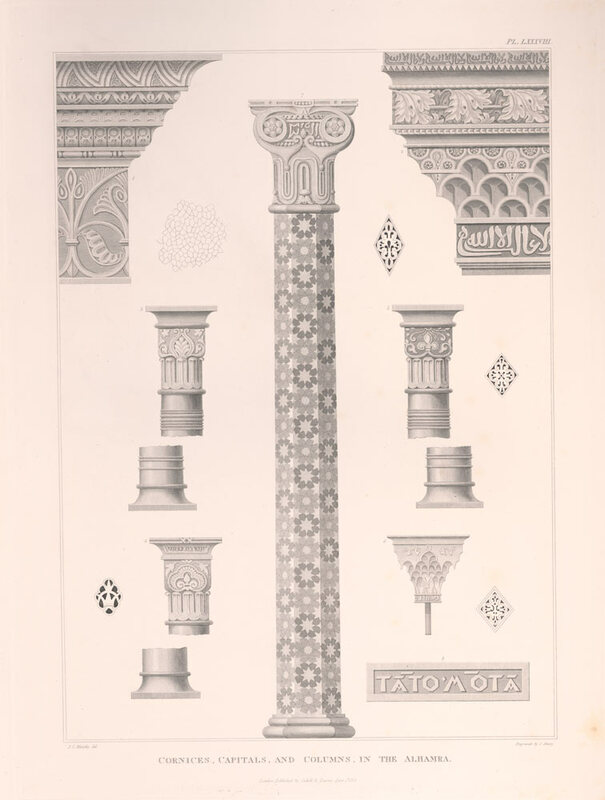 I. Shury, after James Cavanah Murphy, Cornices, Capitals, and Columns in the Alhamra from The Arabian Antiquities of Spain, plate 88 (1815), engraving, 64 x 48 cm. Northwestern University Library, Evanston, IL. The memory of the Moors is still alive in Granada. One would say that it was yesterday that they left the city, and, if one judges from what they left behind, it really is a shame. The abode of beauty is here, as if it had been inhabited but yesterday. 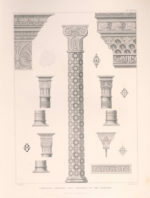 James Cavanah Murphy’s 1815 Arabian Antiquities of Spain marks the first major British visual study of the great Islamic monuments of the Iberian Peninsula: the Alhambra of Granada and the Great Mosque of Cordoba. Containing nearly 90 elephant-folio engravings with accompanying textual descriptions, this compilation sits at the intersection of two genres of Enlightenment and post-Enlightenment engraving projects. On the one hand, its systematic display and dissection of architectural spaces recalls the classificatory impulses of the Napoleonic Description de l’Egypte (1809–1828), the first volumes of which had been published in France several years earlier. On the other, it aligns itself with a major project of the Hispanic Enlightenment concerned with recuperation of the region’s Islamic heritage, namely Las Antigüedades Arabes de España (The Arab Antiquities of Spain), published in two volumes by Madrid’s Real Academia de Bellas Artes (Royal Academy of Fine Arts) in 1787 and 1804. Murphy (1760–1814), an Irish architect and amateur archeologist who had previously published on Portugal’s medieval architectural heritage, traveled to Spain in 1802 to begin work on Arabian Antiquities. His sojourn was terminated by the Napoleonic Peninsular War, which erupted in 1808 as a result of Spanish and British resistance to the French occupation of Spain, and only ended with Napoleon’s fall in 1814. Fraught with famine and guerrilla warfare, this occupation made Spain too volatile for Murphy to continue his research. In 1809 he returned to England, where Arabian Antiquities was completed; it was published serially between 1815 and 1816, roughly a year after both Murphy’s death and the French expulsion from Spain.